The phone is barely out of the gate and Google is already showering it with updates. Immediately after launch, the Verizon Galaxy Nexus in the US received a new update, which updated the phone from Android 4.0.1 to 4.0.2. As you can see from the image above, the list of improvements is quite extensive. The update weighs in at 10.7 MB and is made available to download as soon as you activate your new device. 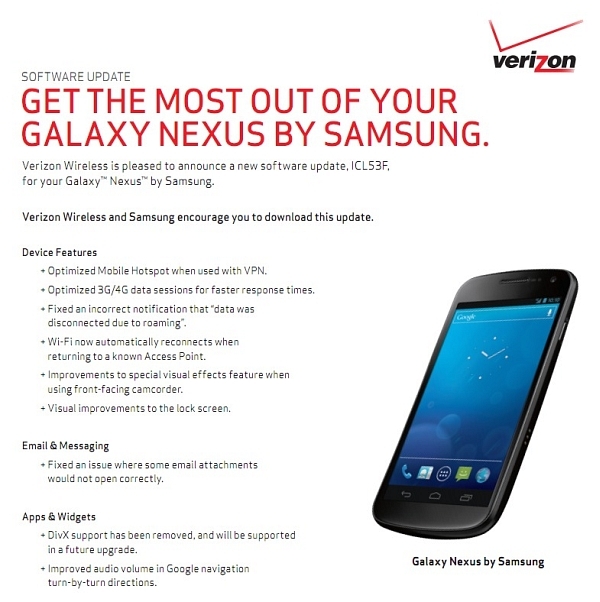 We are assuming this update will make its way across the Atlantic Ocean to the many Galaxy Nexus in Europe soon. This phone have too many bugs and kwalite is 0. Kamera is behind S2.Screen contrast is low.Standby time is too low.Speaker voice is too low than Htc Desire HD. I think ics version not ready yet.